Love these muffins! The addition of whole wheat flour helps with making them healthier. Add in chocolate chips to make them even better! In a large mixing bowl, combine flour, sugar, baking soda, baking powder, cinnamon, and pumpkin pie spice. If you don't have pumpkin pie spice you can use this link to make your own. I hadn't used it before and now that I know about it, I'm always going to use it! Less measuring!! In another bowl, melt butter. Then combine pumpkin with the butter. Add pumpkin mixture and eggs, one at a time until mixture is incorporated. If you want to use chocolate chips, gently stir them in now. 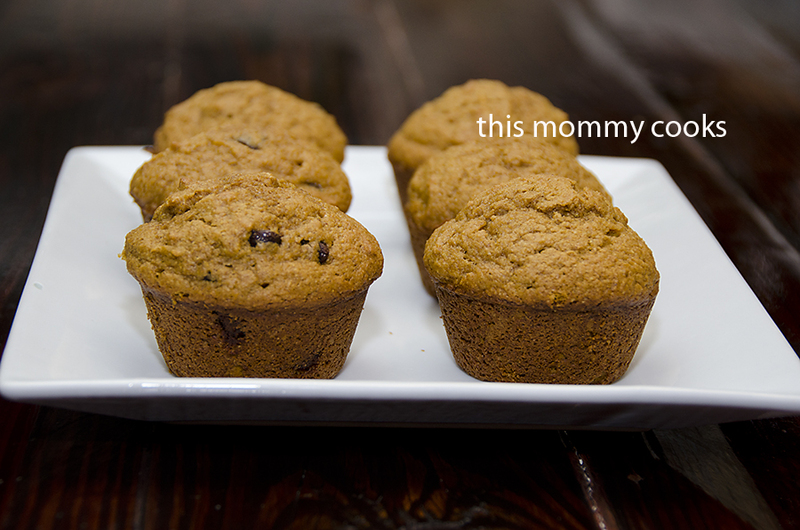 Spoon mixture into 12 muffin cups lined with paper or sprayed with nonstick spray.